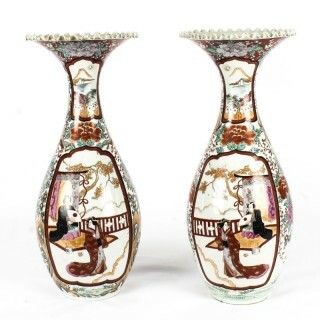 A monumental pair of Japanese Meiji period Imari porcelain vases, dating from the late 19th Century. 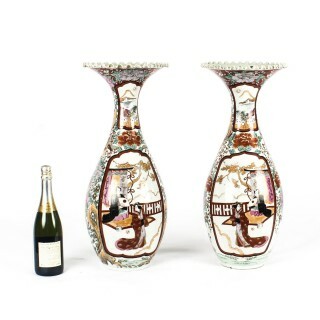 Each vase features a bulbous shape with the traditional scalloped rim, over the body decorated with reserve panels depicting court garden scenes and smaller shaped panels with views of Mount Fuji on chrysanthemums and peonies background adorned with phoenixes. Each signed to the base with a three-character mark and on the top of each large panel with a two-character mark. Imari ware is a Western term for a brightly-coloured style of Arita ware Japanese export porcelain made in the area of Arita, in the former Hizen Province, northwestern Kyūshū. 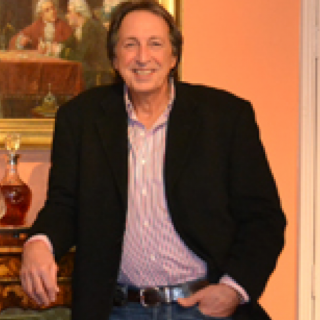 They were exported to Europe in large quantities, especially between the second half of the 17th century and the first half of the 18th century. Typically Imari ware is decorated in underglaze blue, with red, gold, black for outlines, and sometimes other colours, added in overglaze. In the most characteristic floral designs, most of the surface is coloured. The style was so successful that Chinese and European producers began to copy it. 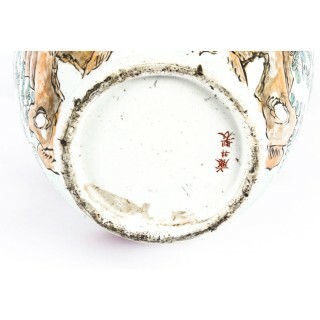 Sometimes the different overglaze styles of Kakiemon and Kutani ware are also grouped under Imari ware. The name derives from the port of Imari, Saga from which they were shipped to Nagasaki, where the Dutch East India Company and the Chinese had trading outposts. In the West the multi-coloured or “enamelled” wares became known as “Imari ware”, and a different group kakiemon, while blue and white wares were called “Arita ware”, in fact, the two types were often produced at the same kilns. Today, the use of “Imari” as a descriptor has declined, and they are often called Arita wares (or Hizen wares, after the old province). 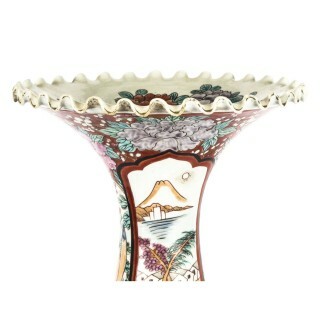 Imari ware was copied in both China and Europe and has been continuously produced to the present day. 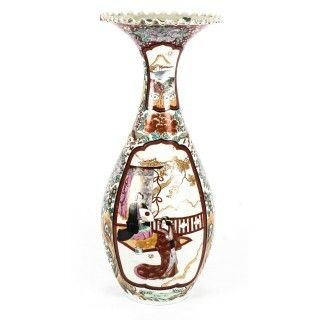 Early Imari (shoki imari) is a traditional and somewhat confusing term used for very different wares that were made around Arita before about 1650. The porcelains are generally small and sparsely painted in underglaze blue for the domestic market, but there are also some large green celadon dishes, apparently made for the southeast Asian market, in a porcellaneous stoneware. Arita’s kilns were set up in the 17th century after kaolin was discovered in 1616. A popular legend attributes the discovery to an immigrant Korean potter, Yi Sam-pyeong (1579–1655), although most historians consider this doubtful. After the discovery, some kilns began to produce revised Korean-style blue and white porcelains, known as Early Imari, or “Shoki-Imari”. 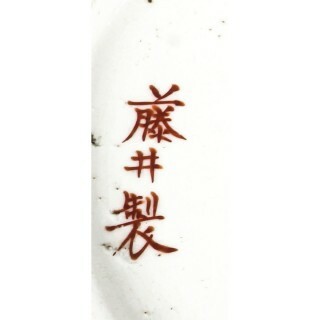 In the mid-17th century, there were also many Chinese refugees in northern Kyushu due to the turmoil in China, and it is said that one of them brought the overglaze enamel colouring technique to Arita. Thus Shoki-Imari developed into Ko-Kutani, Imari, and later Kakiemon, which are sometimes taken as a wider group of Imari wares. Ko-Kutani was produced around 1650 for both export and domestic market. Kutani ware is characterized by vivid green, blue, purple, yellow and red colours in bold designs of landscapes and nature. 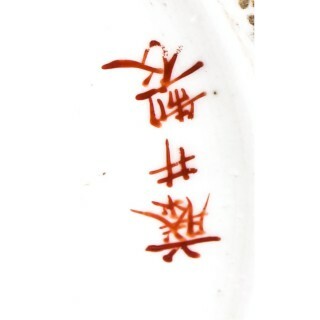 Blue and white porcelain pieces continued to be produced and they are called Ai-Kutani. 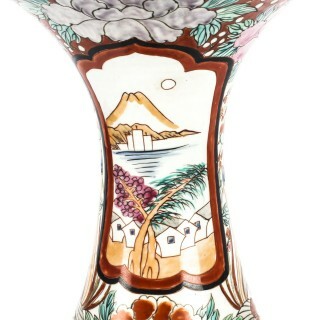 Ko-Kutani Imari for the export market usually adopted Chinese design structure such as Kraak style, whereas Ai-Kutani for the domestic market were highly unique in design and are accordingly valued very much among collectors. 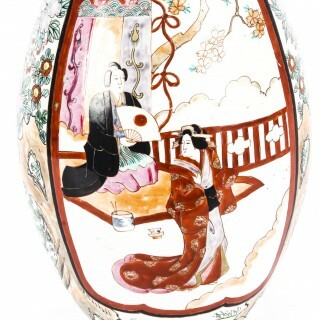 Ko-Kutani style evolved into Kakiemon-style Imari, which was produced for about 50 years around 1700. Kakiemon was characterized by crisp lines and bright blue, red and green designs of dramatically stylized floral and bird scenes. Imari achieved its technical and aesthetic peak in the Kakiemon style, and it dominated the European market. Blue and white Kakiemon is called Ai-Kakiemon. The Kakiemon style transformed into Kinrande in the 18th century, using underglaze blue and overglaze red and gold enamels, and later additional colours. 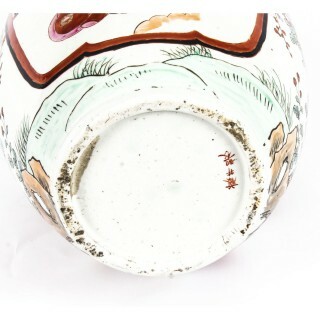 Imari began to be exported to Europe when the Chinese kilns at Jingdezhen were damaged in the political chaos and the new Qing dynasty government halted trade in 1656–1684. 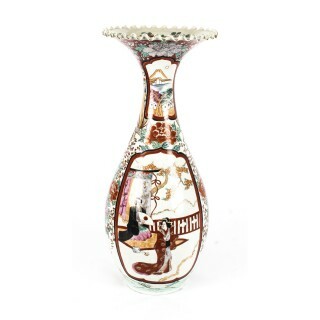 Exports to Europe were made through the Dutch East India Company, and in Europe the designation “Imari porcelain” connotes Arita wares of mostly Kinrande Imari. 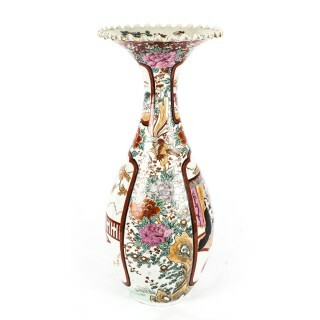 Export of Imari to Europe stopped in the mid-18th century when China resumed export to Europe since Imari was not able to compete against Chinese products due to high labour costs. 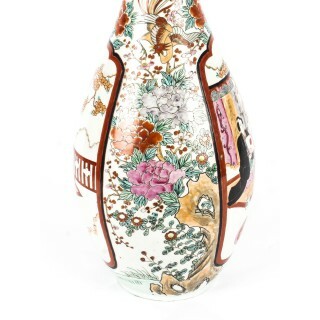 By that time, however, both Imari and Kakiemon styles were already so popular among Europeans that the Chinese export porcelain copied both, a type known as Chinese Imari. 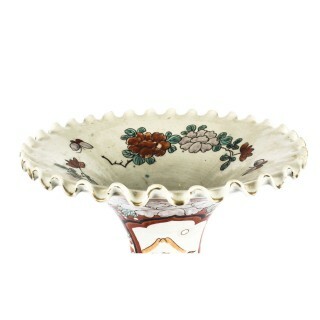 At the same time, European kilns, such as Meissen and English potteries such as Johnson Bros. and (Royal) Crown Derby, also imitated the Imari and Kakiemon styles. 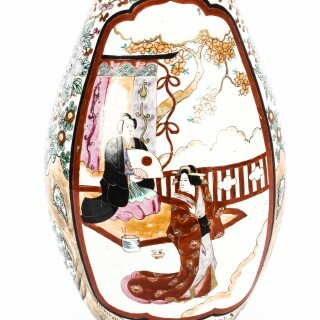 Export of Imari surged again in the late 19th century (Meiji era) when Japonism flourished in Europe. 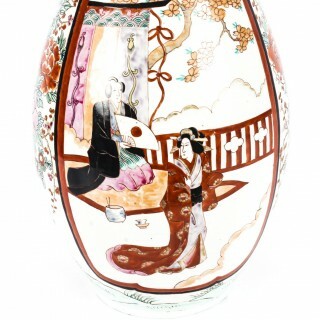 Thus in the western world today, two kinds of true Japanese Imari can be found: that exported in the mid-Edo period, and that exported in the Meiji era. From the viewpoint of collectors, these two types are completely different, though Kinrande appearances are similar.